Dr. Jie Hu currently is an Associate Professor at the Ohio State University, College of Nursing, USA. Dr. Jie Hu earned her PhD degree from the University of Arizona, USA. She is a Fellow in the American Academy of Nursing. Dr. Hu served as a member of Global Advisory Group on Nursing and Midwifery of the World Health Organization from 1997-2001. 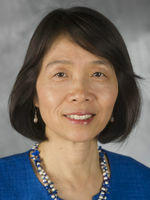 Dr. Jie Hu’s area of research includes diabetes self-management intervention with focus on minority populations (Hispanics and Chinese); health-related quality of life in older adults with chronic diseases.